The play (if not the published script) opens with Mrs Liversidge’s spiritedly inept performance of Ivor Novello’s We’ll Gather Lilacs in the Spring Again.2 Its heightened, ‘florid’ delivery is so different from Mam and Dad’s prosaic understatement that it has been called an ‘ironic prologue’.3 However, the song’s lyrics anticipate key moments (‘never leave me’… ‘when you come home once more’), create a relevant sense of moving on by looking backwards (gathering lilacs ‘again’) and foreshadow Mam’s moment of articulacy in the Lake District later, when she performs a poem featuring daffodils. The characters’ landscape is expressed in the next few scenes. Mam visits a friend in a ‘half-demolished, half-developed slum area in Leeds’, and has a ‘slow and disconnected’ conversation, between two people who ‘aren’t really talking to one another, or listening much’.6 This is evoked by Frears shooting from outside the council flat, placing Mam and her friend in separate window panes (while the railway noise requested in the script reminds us that working life goes on), and confines Mam in the frame (as windows often do during the play): visuals and performance replace Bennett’s omitted line ‘I’m smothered in here’.7 Sunset Across the Bay shares themes with Alan Plater and Brian Parker’s Land of Green Ginger, a Play for Today shot in 1972 just 60-odd miles away in Hull.8 There, characters relocated to new estates coped with enforced relocation, whose negative effects were considered by Plater9 in light of Jane Jacobs’s pioneering urban planning study The Life and Death of Great American Cities, which saw people ‘expropriated, and uprooted much as if they were the subjects of a conquering power’.10 Jacobs argued the need for walkable streets, estates ‘rewoven back into the fabric’ of cities, and commercial, cultural and social ‘diversity’11 rather than fixed ‘cultural zones’. Bennett’s line about walking the street without seeing ‘a person to speak to’, or the wish of one resident to punish the architect, chimes with Jacobs and Plater. 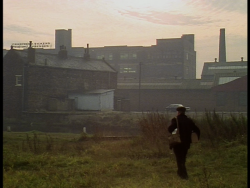 Leeds location filming and voice-overs combine again to place images of demolition and new construction alongside Dad’s thoughts about Leeds being founded by monks who set up what became Kirkstall Abbey (echoing Bennett’s expertise in medieval history) and confusion about which street a flyover replaced. This geographical disorientation underlines the changes that he will experience to his actual and metaphorical landscape. The remorselessness of change is stressed through editing, with rhyming cuts between flyovers and barriers, and an interest in motorways as a problematic symbol of progress, as in Rhys Adrian’s The Foxtrot.14 Dad’s thoughts replace Bennett’s published sequence of city centre images over which Mam spoke a voice-over about change,15 seeing ‘no pleasure’ in shopping when cars are prioritised over people. The further omission of another Mam voice-over16 denies us a sense of Mam’s thoughts, which gives a sense of Dad’s voice dominating (indeed he directs us – when he says ‘look at it’, we do) and will add ambiguity to the play’s final scenes. Dad explains their Morecambe move while on the allotments (Bennett recalled former music-hall star Albert Modley’s role as Dad’s friend in this scene, including the tricky negotiation of Modley’s reliance on his famous prop hat and catchphrase).19 But tensions show in a bed conversation between Mam and Dad, with Mam’s nostalgic rendering of a song (on Empire Day, itself a marker of former glories) plus gossip about scandal which prompts a past-tense exchange: Mam’s comment that ‘we were happy’ and Dad’s snapped reply, ‘I’m not saying we weren’t’. The scene ends with Mam only just noticing a crack in the ceiling that looks like ‘a man spoking a pipe’: a lovely Bennett touch that also implies that Mam may be the only one noticing cracks between them. Mam and Dad meet a woman at a bus shelter looking out at the sea, and although her conversation (‘I have my main meal at night’) makes Dad call her a ‘boring woman’, as if she has not adapted to losing her husband (Dad wonders if it was ‘a happy release’), she has been more successful at maintaining normality after a life-changing event. Her lack of a husband (flagged up in a symmetrical shot opposite Mam and Dad) serves also to foreshadow Dad’s later departure (which makes Dad’s ‘happy release’ jibe more affecting). Also, the woman displays unexpected depths, returning (not in the published script) to ask: ‘Have you ever thought about the sea?… How wonderful it is. It comes in, and it goes out’. Dad’s reply is prosaic – ‘It’s the tides. It’s to do with the moon’ – but the boring woman thinks ‘people take it too much for granted’, a pointed moment given that Mam then engages Dad with a less poetic topic of debate (‘Look at that feller’s trousers’). Mam, whom Dad elsewhere chides for being ‘morbid’ for talking about their age, may be tactically changing the subject. When Dad is not around, the boring woman speaks about her decision to stop resuscitating her husband, as he ‘wasn’t like my husband, not at the finish’ and she feels that ‘the body knows best’. The Lake District was Wordsworth’s birthplace27, and the poem resonates with Mam’s situation, given James A. Butler’s observations that the poem’s speaker is ‘remote from the natural world’, embracing a ‘vision of unity’ and ‘finding in his memories continuing renewal for future times’.28 These provide a way of reading the distanced wandering in Morecambe long shots, and characters whose discourse is largely rooted in memory (the fact that Wordsworth was looking back, two years after observing the daffodils, parallels the past tense at work in the scene: Mam’s recitation from school, her memories of Gran’s description of sunsets and Dad’s wartime memories). Joseph H. O’ Mealy also relates the scene to the opening sequence’s references to lilacs, and notes Bennett’s interest in marginalized people pushed ‘away from the Wordsworthian romantic sublime of a world saturated with daffodils and lilacs and toward Matthew Arnold’s modern world, dominated by the “unplum’d, salt, estranging sea”.’29 Mam begins ‘I wandered lonely’ in a mid-shot which excludes her husband and son, followed by a pan to the right (a shot largely associated with Dad’s wanderings), which is interesting because so far she has wandered not alone but with Dad. The Wordsworth parallels offer further interest: Wordsworth witnessed the daffodils with his sister Dorothy, but excluded her from his account: finding this characteristic of Wordsworth, Butler observed ‘his appropriation of some of her language – as he concentrates solely on his own moods.’30 Does this reflect on her relationship with Dad post-retirement? Had Mam continued her recitation, she would have reached the phrase ‘the bliss of solitude’. 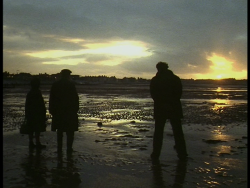 A dissolve between two elegantly-composed landscape shots takes us from the Lake District to the three family members looking out at the sunset across the bay at Morecambe.31 During the dissolve, a tree briefly occupies the same part of the frame as Mam: is this emphasizing her strength, or the epiphanic moment of her recitation? After all, nature was for Wordsworth ‘a symbol of the spirit beyond the rational understanding of man’, associating the ‘wonder and excitement’ of the sublime with childhood and mourning ‘how, as an adult, his imaginative powers have declined’.32 There are marked differences in dialogue: Mam’s vision has almost changed (‘This morning, Grange was ever so plain’), while Dad rejects moving to Australia because ‘I can’t see what difference it makes where we are’. His work-based phrase for going home, as he talks about ‘knocking-off time’, seems almost defeatist: and the end soon comes. Visiting the cinema (where, relevantly, we hear the phrase ‘The past is a foreign country: they do things differently there’ in a trailer for the Joseph Losey/Harold Pinter film version of L.P. Hartley’s The Go-Between), Dad underlines his resistance to change by bemoaning modern cinema’s ‘right funny endings’, but the play has one to come. Outside, he feels unwell but, after sitting on a bench looking out to sea, walks on. Dad goes into a public toilet to ‘shed a tear’, a euphemism that might suggest ‘a depth of unspoken sorrow that perhaps even he cannot fathom’.33 Mam moves around in static frames as time passes slowly, until we discover that he has had a stroke: only when the ambulance arrives do they drop their labels and call each other Alice and Frank. Mam’s hospital visit to ailing Dad is a painfully economical sequence. 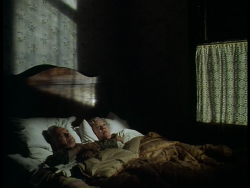 There is the shot/reverse-shot cutting sequence in which Dad does not overtly return Mam’s gaze (this with compositions recalling earlier bed scenes between them), as if confirming the boring woman’s earlier statement about her husband no longer being himself. Then there is a long-held shot of Mam walking down a corridor out of the ward as trolley-bearers pass. 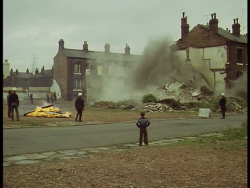 This is as spare a depiction of institutional space as Alan Clarke’s work from the period.34 Three understated scenes conclude the play, including a poignant shot of Mam alone in bed, on Dad’s side. 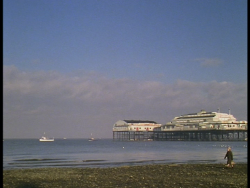 The ending is surprisingly ambiguous: Mam walks the seafront, initially in a very long shot that recalls Dad’s earlier wanderings. She acknowledges the boring woman who looks out from the bus shelter, and Mam walks on, exiting the frame. The space in which she finds herself could indicate loss and ‘an increase in Mam’s isolation’,35 as in Bennett’s description of ‘Vast empty sands, with the tide out’ and Mam’s ‘little smile’.36 But the fact that she is no longer looking from windows or (unlike the boring woman) the bus shelter, and is walking what was Dad’s space, might also suggest a kind of freedom. This was Bennett’s second transmitted television play after A Day Out37, which had also been directed by Frears and produced by another Bennett regular, Innes Lloyd. Sharing the critical convention that television drama is a writer’s medium,38 critics have seen in it Bennett’s movement towards ‘genuine Bennett territory’ because he moves from ‘the historian’s distance’ to ‘the observer’s personal proximity’39 and anticipates later plays that feature ‘people on the margins being pushed further off the map’ in ‘the landscape of the aging and changing north’40 and is ‘the first’ of many ‘Bennett plays about the concerns of the elderly’, which facilitates ‘his gift for investing the outwardly mundane with immense poignancy’.41 The play’s place in Frears’s development as a director is less often remarked upon, despite correlations with, for example, the changing Liverpool streets explored in Gumshoe (1971). Critics who are more biographically-inclined than me have seen the plot as ‘essentially the story of how Walter and Lilian Bennett left Leeds to go and live in Clapham in 1966’.42 Bennett accepted that “Mam” and “Dad” ‘were not unlike my parents’, but argued that ‘whereas in the play their lives are lonely and unhappy and their expectations from retirement unfulfilled, Mam and Dad’s retirement, even with Mam’s depression, was one of the happiest times of their lives’,43 a ‘heyday’ in which they were ‘laughing, still silly and full of fun’.44 However, the play’s sad plot development made Bennett worry about prophecy as if he was, bizarrely, ‘in some degree responsible’ for his own father’s heart attack, which took place in August 1974, between the writing and filming of the play. Since this piece was written, Sunset Across the Bay has been released on DVD, in the excellent collection Alan Bennett at the BBC. Originally posted: 30 September 2009 on the old Play for Today mini-site version of this site. 23 January 2017: added images to add to and replace old compressed or missing images; standardised punctuation either side of endnote markers; minor single-word alterations; removed several endnotes on future research plans. 4 March 2017: standardised presentation of ‘Updates’ legacy information (2009, 2010) in line with current site practice.